Mariel here. To the collective frustration of all four sets of his grandparents (lots of divorces in our family), my husband and I don’t give our son sugary treats like cupcakes, ice cream or candy. That’s not to say we’ll deprive him of the sweet stuff for the rest of the days, it’s just that he’s under 2 and it seems unnecessary. At the moment, when he asks me for “cake,” he’s referring to rice cakes, and I think that’s awesome. 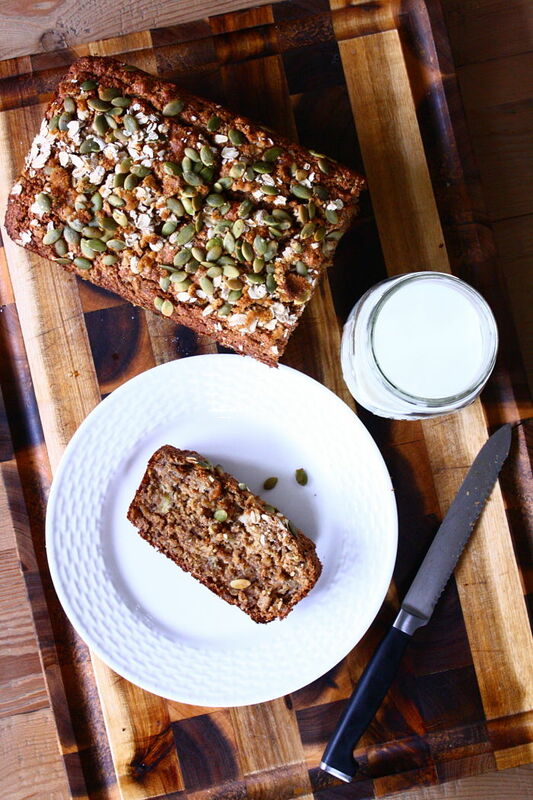 This oat-filled banana bread is the closest we’ve gotten to giving him an actual baked good and, as you can probably imagine, he thought it was the tops. He gobbled up half a slice in record time and asked for “some more,” only this time, “Big. Please.” While I’ve had my fair share of sugar-loaded bakery treats, this banana bread, with its healthy helping of rolled oats, whole wheat, applesauce and ‘nanas, was as delicious as any of the more decadent renditions. The trick to getting it just right is to slightly under-cook it so it stays moist and doughy. Sorry for saying moist. 1. Preheat the oven to 350 degrees. Spray a 9-inch loaf pan with cooking spray and set aside. (depending on whether you use a glass or metal loaf pan you’ll need to adjust baking time, which is mentioned below). 2. In a medium bowl, combine the flour, oats, baking soda, baking powder, salt and cinnamon. 3. In a large bowl, whisk together the remaining wet ingredients. 4. Gradually add the dry ingredients to the wet ingredients, stirring with a wooden spoon until just combined. 5. Pour the batter into the prepared loaf pan. Sprinkle with any combination of the optional toppings (or none at all). If using a metal loaf pan, bake for 60-65 minutes, or until a toothpick inserted into the center comes out clean. If using a glass loaf pan, bake for 50-55 minutes, or until a toothpick inserted into the center comes out clean. 6. Cool on a wire rack then divide into roughly 12 slices. Keep bread sealed or tightly wrapped so it doesn’t dry out. Another banana bread recipe to add to the collection. Yum! That looks great. I like the use of honey instead of sugar. This is a crazy question but what could i use instead of bananas?